A particular day, a particular moment, and everything changes. I’m going to quit griping about all this new technology, because two days ago it brought me an email from “The Newspaper Man,” whom I had written about on August 8. 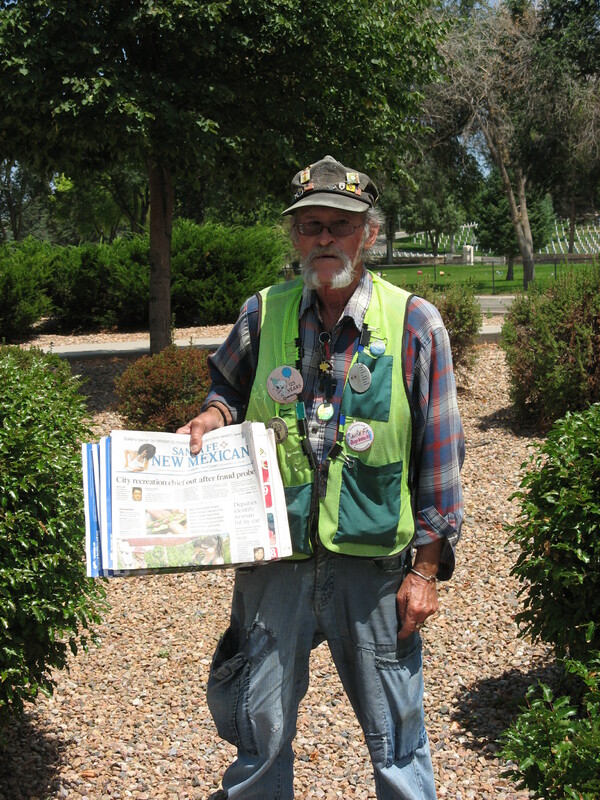 John O’Donnell has been selling The New Mexican on foot in Santa Fe for more than 25 years, most recently at the corner of Guadalupe and Paseo de Peralta north. No more, however. I had given John my email address and blog site when he consented to an interview, and I had been saving a copy of the post and his photographs to give him the next time I saw him. I’m not often at his location in the morning, however, and only recently realized that I was going to have to track him down. Then I received the email saying that he had been hit by a car and seriously injured. He is in Room 204 at Casa Real and will be there until late October. I went to visit him yesterday afternoon, and he told me the story as he sat smoking a couple of Marlboros in a wheelchair in the patio of the facility. He had safely crossed that intersection at St. Michael’s for 15 years he said; but on this day he was struck by a Jeep. Timing is everything. A particular day, a particular moment, and everything changes. John’s collar bone was broken and so was an elbow and probably his left foot, which is in a tall boot. The wounds on his head and hands are healing, but they are still imposing. I had brought homemade shortbread cookies and a card saying that we would all be looking forward to seeing him back on the corner again soon. However, I learned during the meeting that he had been laid off even before the accident. There will be a ruling, but he thinks the driver was at fault and had good insurance. John has many friends from all his years with the newspaper, and he said he had told some about my blog. I offered to add this information in the hope that it would reach them. I can’t yet name what it is that I recognize in him, but there is something special about John O’Donnell. I’ll be back again to pay my respects.